Jacqueline Brustkern, a junior at the University of Texas at Austin, powered through the Table Mountain hike with a shift in attitude and perspective. Check out her inspiring blog! We were forewarned about the hike up Table Mountain ahead of time. The staff told us “be prepared for the hardest hike of your life… it’s basically a 2-3 hour stair climber”. I guess the majority of us didn’t take that seriously enough. When we began our hike on Friday morning, ten minutes in we realized the weight of what they were trying to tell us. Needless to say, there was a slight sense of negativity coming across the group, including myself, as we realized the endeavor we were about to take on. All I could think about was how much my legs hurt, how hot or cold I was at the time, and how much farther I had to go. 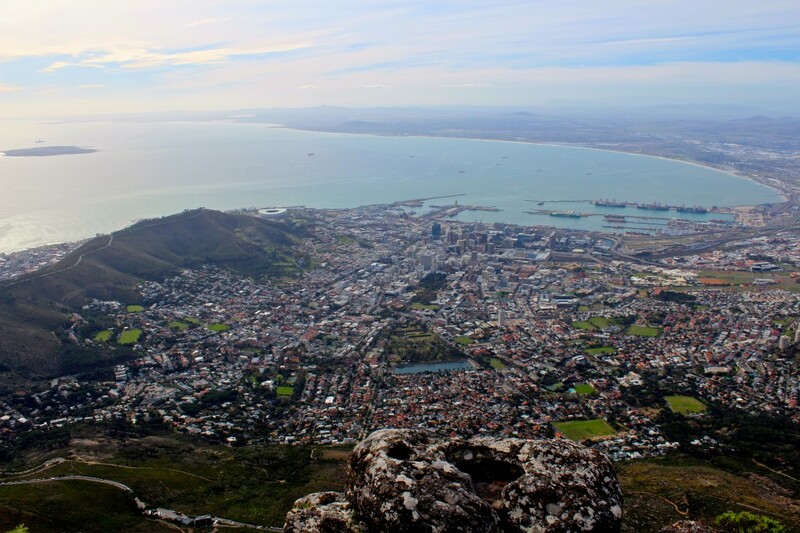 I must admit, I was a little bogged down, as I had high hopes for this hike being one of the highlights of my time in Cape Town. I continued on my way, mostly in silence, until I came across a group that I realized was going about the same pace I was. As we started to discuss how we might not make it up, we continued forward putting one foot in front of the other. After hitting a mental and physical block pre-halfway, we made a commitment to no more negative comments. Only positive contributions from there on out were allowed. At this moment, my perspective shifted. I can’t even begin to explain the turn around this made in my hiking experience. We began asking each other questions from “what’s the story behind your middle name” to “what’s one movie you would want to play a role in”. We sang callback songs as we climbed up the mountain, laughing at the looks we got from people passing by on their way back down. We encouraged each other the rest of the way up, and pushed each other to keep going because we knew reaching the top would be worth it. But what I found was the journey was just as sweet as the view at the end. I got to know every one in our hiking crew on a deeper level and find commonalities with people I never would have discovered. It took that one comment to choose to stay positive to turn my whole day, hiking experience, and now memory of that adventure around. Positivity is something we should strive for in every obstacle we face. When we focus on the positives, we begin to see the sunshine bouncing off the rocks instead of how much farther we have to climb. We laugh with one another as we struggle our way through the challenge, instead of focusing on the difficulty of the task at hand. You never know the memories, friendships, or experiences that can come out of choosing to be positive. I am thankful for Go Global in encouraging us to take on the mindset to get the most out of every experience. This program has taught me to treat everything in life that way. Whatever life throws at us, we should take it and make the absolute most of it, choosing to be positive no matter what the situation. soooo, I went on the Capetown trip last summer and love to keep up with GL’s website/blog. Know that what you learn in Capetown truly continues to shape your perspective on everything post trip! GL is spot on in everything that they do. I loved reading your blog post- this is awesome!